DefenceArch, LightsOn! and St. Olav Waterway, are three of the 97 projects currently founded by the Central Baltic programme and they all belong to specific objective 2.1 — natural resources developed into sustainable tourism attractions. All Central Baltic projects tackle their challenges with cross-border cooperation in mind and DefenceArch, LightsOn! and St. Olav Waterway are a good example of it. 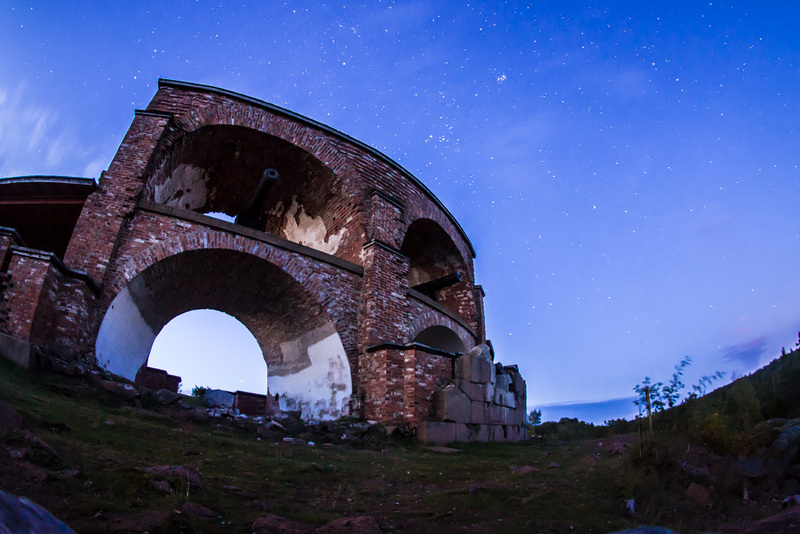 DefenceArch, is developing the historical military sites of the Gålö seal farm, the Bomarsund fortress, the southern cape of Örö and Korpoström into appealing and sustainable tourist destinations. The project also aims at improving accessibility to the localities, by enabling cross-border cooperation in the archipelago areas of South-West Finland, Åland and South-West Sweden. LightsOn! on the other hand, is promoting meaningful historical locations on both sides of the Gulf of Finland: individual sites will become part of a cross- border storyline about places of power in Finland and Estonia. The third project, St Olav Waterway, is creating a pilgrim route, from Turku Finland to the Åland Islands and Hudiksvall city in Sweden via the Archipelago. Suppling visitors with systematic information about the pilgrim route and the chosen destinations, requires a cross-border approach as well. Last spring, representatives from Central Baltic projects LightsOn! DefenceArch and St.Olav Waterway organised a joint seminar in Turku. The event focused on the current tourism situation in the archipelago area, presented the latest trends and illustrated how the three projects plan to increase the attractiveness of the area. The seminar target groups were stakeholders working in the field of Tourism in the South-West Finland archipelago area. But what do these projects have in common and where did the idea of a joint seminar stem from? Was sharing the planning and execution of the seminar useful? To answer these questions, I set up an interview with a representative of each project involved in the organisation of the seminar, Telle Tuominen from DefenceArch, Nina Luostarinen from LightsOn! and James Simpson from St. Olav Waterway. What do these three projects have in common? The projects have in common many aspects. They are not only financed by the same instrument, they also deal with sustainable tourism. In addition, some of their localities in the Archipelago of South-West Finland are close to one another. What this means, in practice, is that very often their target groups overlap. Where did the idea of a joint seminar stem from? The three project representatives, explain that there are many reasons why they decided to organise a joint seminar, such as the fact that the projects’ stakeholders are mostly entrepreneurs living in rural and remote areas of the archipelago and they join project seminars and events either in their spare time or they have to take time off from their business. Nina Luostarinen from LightsOn! elaborates upon this point by adding: “Organising too many seminar and trainings, feels like stealing time from their business, which is their livelihood; we decided to join forces to be more efficient”. James Simpson, from St. Olav Waterway, comments on this topic by adding that “This is one of the reason we decided to plan a seminar together as well as to raise awareness about our project and to get more media visibility: sometimes stakeholders do not join seminars because they think the topic is not really interesting for them. 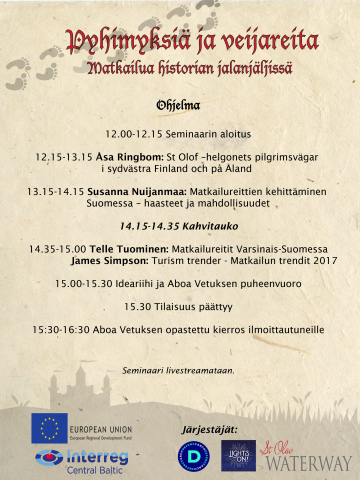 For example, our project focuses on pilgrimages and some stakeholders perceive it to be very religious, so they might not be interested in joining a seminar organised just by us, but if we have a joint event, they might participate: at first, they are interested in another project and then, after attending, they usually realise that also St. Olav Waterway could be useful to them. The point is capitalising on networks to get a broader audience”. Another reason behind the organisation of a joint seminar, is the potential increase in media visibility, Telle Tuominen mentions: “each project and project partner have different media contacts. By taking advantage of different personal connections and networks, each project can gain more media visibility”. According to James Simpson organising joint events is also useful because: “if the aim is to support the concept of sustainable tourism, bringing the message forward under the same banner with other projects have a bigger impact”, which in the case of the joint seminar the three projects organised was the name of the event: “Pyhimyksiä ja veijareita, matkailua historian jalanjäljissä (Saints and kings, tourism in the footsteps of history)”. The benefits of recognizing project synergies and use them to plan joint activities, such as a seminar for the project stakeholders were recognized by Telle Tuominen who was the primus motor that brought the organisers together. “I have known Nina for many years, moreover our projects have a partner in common” — Park and Wildlife Finland is in fact DefenceArch project partner and LightsOn! lead partner — “so it felt quite natural to start a collaboration”. “I met with James Simpson at a Travel fair in Helsinki” she continues “and because some of the areas we are developing are really close to each other, I thought it would make sense to find ways to cooperate with St. Olav Waterway as well. DefenceArch had planned an event for February, but we soon realised that it was a bit early to talk about tourism in the archipelago, so I started thinking that we could rather wait a couple of months and plan an event in cooperation with LightsOn! and St. Olav Waterway. I contacted them and we have cooperated ever since: in addition to the joint seminar, we are in fact planning another event together that will take place in Turku in the Spring”. According to the three project representatives I interviewed, synergies between projects are a way to better reach target groups when implementing project activities and to echo the message of the benefits of EU founding. For this purpose, they plan to continue their collaboration also in the future. Their next joint event, aimed at promoting the products developed and the results achieved by the projects, will take place on 21 April at the Forum shopping centre and in other places surrounding the centre of Turku.